[S1101] Email from Ferrell Moultrie (e-mail address) dated 29 Dec 2012., Email from Ferrell Moultrie (e-mail address) dated 29 Dec 2012. Loyce was born at Mt. Pleasant, Titus County, Texas, on 2 January 1903.1 He married Lucille Reynolds in 1926.1 Loyce died on 23 September 1939 at Prarie Grove, Arkansas, at age 36.1 He was buried after 23 September 1939 at Prairie Grove Cemetery, Prairie Grove, Washington County, Arkansas. [S964] Source: E-mail from Emma Jean Tabb (e-mail address) dated 1 December 02. Emma Jean Tabb died. Emma was born in 1924. 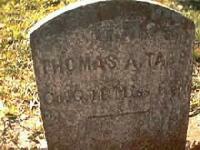 [S329] Cemetery inscriptions found on the Internet and ascribed to Calvary Assembly of God Church, Decatur County, Georgia. Information was collected and transcribed on 04 October 1998 by Denise Kirkland Smiley. Mary was born at Oktibbeha County, Mississippi, on 9 February 1841. 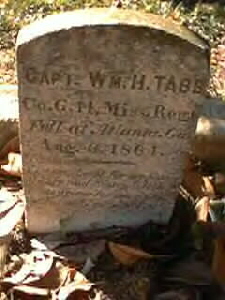 She married Adam Tooley Moore at Marion, Perry County, Alabama, on 14 December 1869.1 Mary Frances "Mollie" Tabb died in 1921 at Marion, Perry County, Alabama.